You know it’s big news when the National Oceanic and Atmospheric Administration makes a bust. Yes, nation’s weather trackers are also the country’s sea critter cops under its Marine Fisheries Service duties (a few years ago, I used NOAA officials on a piece I did about whale vomit trafficking, but I digress). Last week, a federal grand jury handed up an indictment in a NOAA investigation into illegally imported narwhal tusks. I have no idea what’s behind the allure of the tusks. Are they a folk medicine like elephant tusks and rhino horns? Whatever it is, I bet the unicorns are behind it. Below is the Department of Justice release on the case. It mentions the indictment was partially unsealed, which leads us to believe others will be named. WASHINGTON— A New Jersey man was arrested today for crimes related to the illegal importation and illegal trafficking of narwhal tusks (whale tusk) and associated money laundering crimes, according to Ignacia S. Moreno, Assistant Attorney General for the Environment and Natural Resources Division. On Nov. 14, 2012, a federal grand jury sitting in Bangor, Maine, returned an indictment that was partially unsealed today upon the arrest of Andrew L. Zarauskas of Union, N.J. The indictment also names Jay G. Conrad of Lakeland, Tenn., who was summoned to appear in the District of Maine on Jan. 3, 2013. The indictment charges Conrad and Zarauskas with conspiracy, money laundering conspiracy, smuggling and money laundering violations for buying narwhal tusks knowing the tusks had been illegally imported into the United States, as well as selling or attempting to sell the tusks after their illegal importation. Zarauskas was arrested Dec. 14 at his home in Union. The indictment alleges that from 2007 to 2010, Conrad and Zarauskas purchased narwhal tusks that were illegally imported into the United States in violation of federal law. A narwhal is a medium-sized whale with an extremely long tusk that projects from its upper left jaw. A narwhal is a marine mammal that is protected by the Marine Mammal Protection Act and is listed on Appendix II of the Convention on International Trade in Endangered Species of Wild Fauna and Flora. It is illegal to import parts of marine mammals into the United States without the requisite permits, and without declaring the merchandise at the time of importation to U.S. Customs and the U.S. Fish and Wildlife Service. Narwhal tusks are commonly collected for display purposes and can fetch large sums of money. 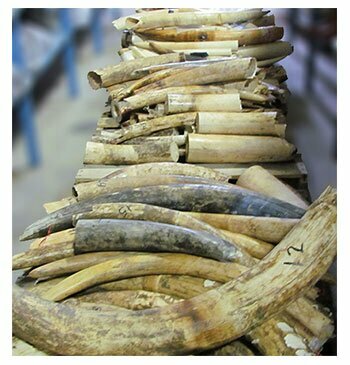 The indictment alleges that Conrad and Zarauskas conspired with people in Canada to import the protected tusks for re-sale in the United States. Conrad and Zarauskas also conspired with people in Canada to launder the funds used to purchase the narwhal tusks by transporting, transmitting, or transferring checks and money orders from Tennessee and New Jersey to Canada, intending that the money be used for further illegal imports of narwhal tusks. The charges contained in the indictment are merely accusations and the defendants are presumed innocent unless and until proven guilty in a court of law. If convicted of these charges, Conrad and Zarauskas each face up to twenty years in prison on each of the most serious charges, as well as fines up to $250,000. The case was investigated by agents from National Oceanic and Atmospheric Administration – Office of Law Enforcement and the U.S. Fish and Wildlife Service – Office of Law Enforcement.